Brecqhou (or Brechou; [bʁɛku]) is one of the Channel Islands, located just west of Sark. Brecqhou is a British Crown Dependency, and is both part of Sark and part of the Bailiwick of Guernsey. It has been established in the courts that Brecqhou is a tenement of Sark. 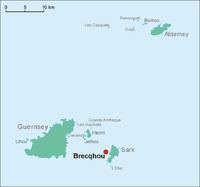 The Ministry of Justice, the department of the United Kingdom government with responsibility for the Channel Islands, considers Brecqhou part of Sark. The name Brecqhou derives from the Old Norse brekka (slope or escarpment; cf. Bricquebec) and holmr (island or islet; see -hou). 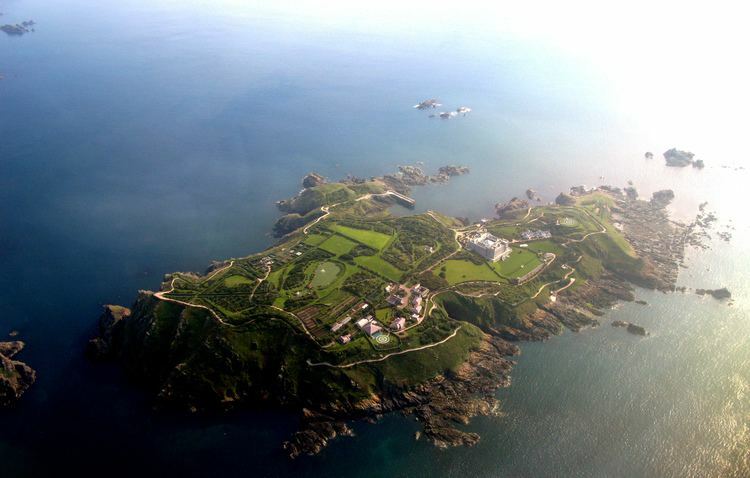 A mere islet, Brecqhou has a surface area of just 74 acres (30 ha). The island is separated from Sark by an extremely narrow sound (Le Goulliot Passage) which, according to legend, has only once been traversed by boat in a high tide. However, in reality it is traversed frequently by yachts during each summer and by fishing boats year round and even forms a part of the route taken by occasional powerboating events in the islands. In Sark, the word tenant is used, and often pronounced, as in French in the sense of feudal landholder rather than the common English meaning of lessee. 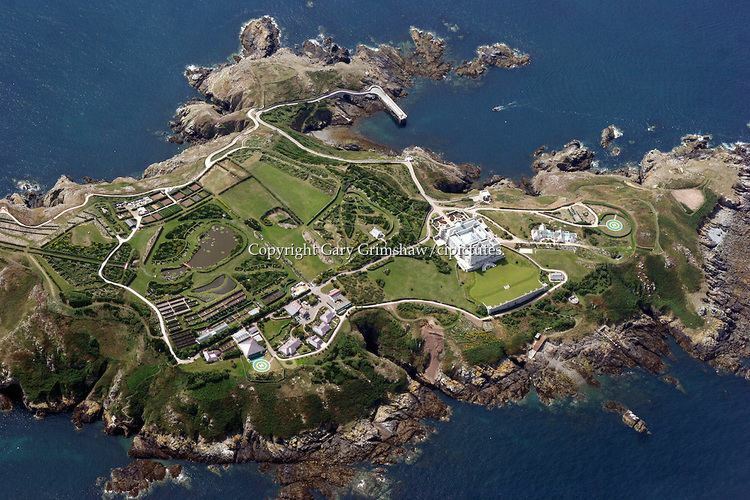 The landholdings of Sark are held by 40 tenants representing the parcels of the 40 families who colonised Sark. As explained on the Sark government website: "There is no true freehold, all land being held on perpetual lease (fief) from the Seigneur, and the 40 properties (Tenements) into which the Island is divided (as well as a few other holdings in perpetual fief) can only pass by strict rules of inheritance or by sale." The relevance of the Seigneurial privileges and of the obligations that distinguish "feudal" from "civil" landowning has decreased, most of the obligations being connected to agriculture and defence. Since 1929, the island of Brecqhou is connected to the title of the tenement La Moinerie de Haut, one of the 40 tenements whose owner had to keep a gun for the defence of the fief and, until 2008, had a seat in Chief Pleas. Originally, La Moinerie de Haut, named after the medieval monastery whose site is close to it, was a parcel of land in the north west of Sark that was, at that time, owned by the Seigneur himself. When Sibyl Hathaway sold the island of Brecqhou to Angelo Clarke in 1929, she transferred the seat in Chief Pleas connected to this parcel to Brecqhou. This was no great loss for her, as she owned more than one tenement and every member of Chief Pleas was entitled to only one vote. Since 1993 the tenement of Brecqhou has been owned by the Barclay brothers, the co-owners of The Daily Telegraph newspaper and former co-owners of The Scotsman. 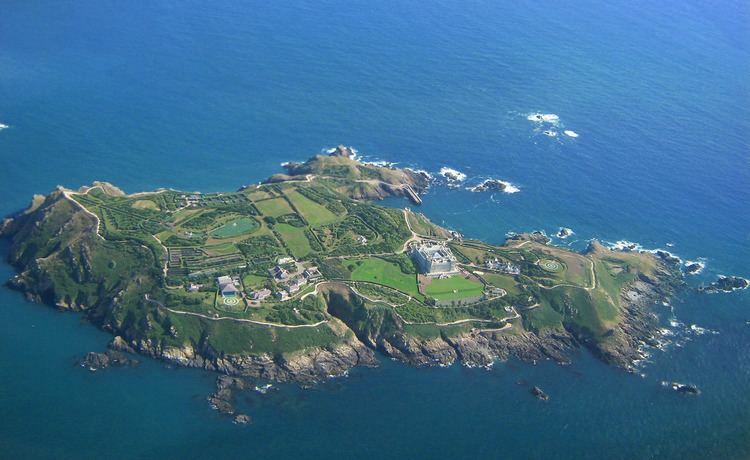 The brothers bought the island for £2.3 million in September 1993. Under the Reform (Sark) Law 1951, the tenant is David Barclay. Since the purchase the Barclays have been in several legal disputes with the government of Sark, and have expressed a desire to make Brecqhou politically independent from Sark. They drive cars on the island, and have a helicopter, both of which are banned under Sark law. 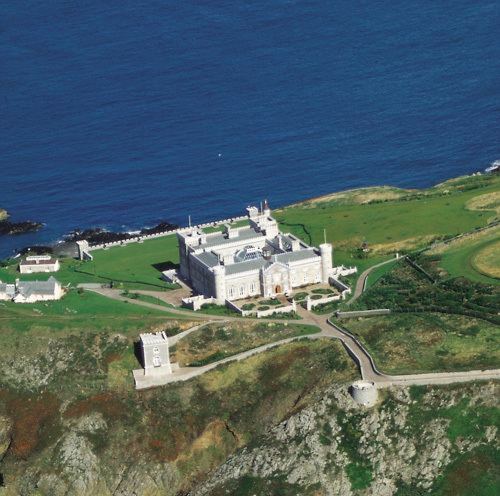 The rule of Sark over Brecqhou is formally based on the retention of Seigneurial rights included in the contract of sale constituting the change in ownership from the Dame of Sark, Sibyl Hathaway, to Angelo Clarke in 1929. According to the Barclays, this retention is invalid, as Brecqhou was never part of the fief of Sark. They argue that letters patent establishing the fief do not mention the smaller island. While the Seigneur eventually came into the ownership of Brecqhou (not before 1681), the island was not merged into the fief. Therefore, in respect of Brecqhou, the Barclays claim that the Seigneurs never held the privileges valid in the fief of Sark, but lost any title to Brecqhou on reselling the island to Clarke. The conflict caused a lawsuit (1996–2000) and the founding of a Brecqhou relationship sub-committee of Sark's Chief Pleas (2006). The former tenant, Leonard Joseph Matchan, had devised a personal flag (identical to the Sark flag, with the exception that the Matchan arms was emblazoned on the bottom right). Although frequently considered the island flag, this was only a personal flag, and is not in use any more. Leonard Joseph Matchan had issued stamps in 1969. Matchan occupied Brecqhou until his death on October 6, 1987. The current tenants have issued postage stamps annually since 1999. In 2012, it was reported that the island is open to the public, by prior arrangement.